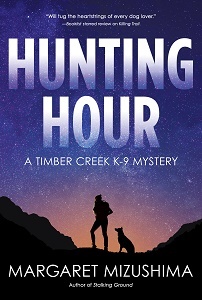 In July, I wrote about Margaret Mizushima’s Timber Creek K-9 mystery series after I finished book two, Stalking Ground. This week I read the third book in the series, Hunting Hour, and want to highly recommend all three books to those who love good mysteries set in interesting places with a cast of characters you’d love to meet in real life…except for the bad guys, of course. In Hunting Hour, Mattie Cobb and her K-9 partner Robo face a challenging and emotional search for a missing child. Sophie is the younger daughter of the veterinarian Mattie cares for deeply, Cole Walker, and she loves his two daughters too much to bear the thought of losing one of them to a kidnapper and possible predator. The girls’ mother, who abandoned the family and has been trying to build a new life while fighting serious depression, comes back when she learns of Sophie’s disappearance. This complicates the family’s relationship to Mattie in the midst of the search for the missing child. Mattie, who’s had to face her own battle with childhood traumas she’d suppressed but is now forced to deal with, is in a turmoil. Loss of focus tampers with her good judgement when she’s faced with potential suspects. The novel is full of emotion and intense drama. There’s a scene where Cole and his ex-wife are face-to-face for the first time in months, and they’re coming to grips with the possible loss of one of their children. When they started to cry, so did I. It’s not the only scene that brought me to tears. The novel is also fast-paced, especially in the search scenes. Again, this whole series is highly recommended. You can purchase the Timber Creek K-9 mystery series in lots of places. I’ve linked the titles to amazon.com. Margaret Mizushima lives in Colorado where she assists her husband with their veterinary practice and Angus cattle herd. She can be found on Facebook, Twitter, and on her website. Kate Fox is a total insider in her small Sandhills community. She’s one of nine brothers and sisters and is connected to everyone in the county by one degree of separation, or less…Kate has an inner fortitude. She does what needs to be done, takes care of business, and doesn’t whine about anything. 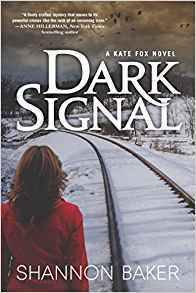 In Dark Signal, Kate has made her decision and is doing her best to solve a murder while fending off over-protective co-workers and supervisors, some of whom believe she’s an upstart in what should be a man’s job. Even her cheating ex-husband tries to help her out when she doesn’t need or want his help. All that pushy testosterone makes Kate a bit edgy, maybe even defensive and grouchy at times, but it doesn’t stop her from doing the job she was elected to do and solving the brutal murder of train engineer Chad Mills. When a major temptation comes Kate’s way–the chance to take over running a ranch which was always her first love–Kate is faced with another big decision. I highly recommend Shannon’s Kate Fox series. You’ll love her, her whole family, and even some of those pushy males who just want to help. Dark Signal is available for pre-order and will be released October 17th. Stripped Bare is available now. Shannon Baker is the author of the Nora Abbott mystery series from Midnight Ink, a fast-paced mix of Hopi Indian mysticism, environmental issues, and murder set in western landscapes of Flagstaff, AZ, Boulder, CO, and Moab, UT. Seconds before quitting writing forever and taking up competitive drinking, Shannon was nominated for Rocky Mountain Fiction Writer’s 2014 Writer of the Year. Buoyed with that confidence, she acquired an agent who secured a multi-book contract with Tor/Forge. Visit Shannon at www.Shannon-Baker.com. She can also be found on Facebook and Twitter.